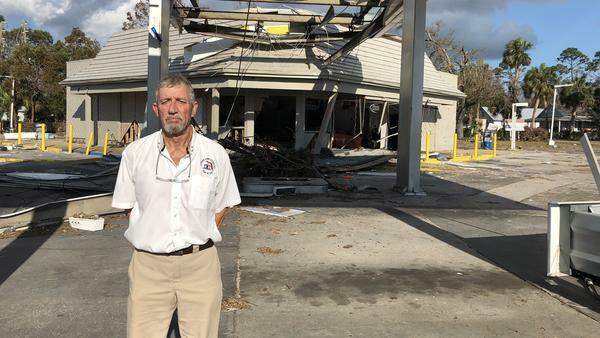 More than a week after Hurricane Michael hit the Florida Panhandle, cities and towns along the Gulf Coast are struggling to begin the rebuilding process. It's been hampered by catastrophic damage not only to homes and businesses but also to vital infrastructure. NPR's Debbie Elliott has this look at what's ahead from the coastal town of Port St. Joe. DEBBIE ELLIOTT, BYLINE: Mayor Bo Patterson drives his pickup truck around Port St. Joe to survey the town's losses. BO PATTERSON: Everywhere you turn and go, you see some kind of destruction, whether it was wind damage or whether it was water - one of the two. ELLIOTT: Patterson says Hurricane Michael pushed in a 13-foot storm surge that flooded the streets closest to St. Joseph Bay. The rest of town saw roofs ripped off, windows blown out and huge oak and pine trees toppled. PATTERSON: Devastating, devastating. I don't know any other word to describe what you're seeing. ELLIOTT: The roof is off the Baptist church, its steeple bent over. The high school is unusable. All the walls are gone from the Burger King. And Port St. Joe's two gas stations are destroyed, the fuel pumps torn from their concrete slabs. PATTERSON: We can't even pump gas. ELLIOTT: Now, how do you start to think about recovering from something like this? PATTERSON: Well, first, cleanup. Get everything cleaned up you can and then start rebuilding. But as you can see, there's trees everywhere. You got to get all those trees and things out of the way before you can really go to work. ELLIOTT: Backhoes are clearing trees from the roads, and crews are working on most streets to replace utility poles. PATTERSON: And see that? You hear that sound a lot - that sound right there - up into almost dark you hear - they're doing all day long. ELLIOTT: Residents are cutting up downed trees and mucking out their homes. PATTERSON: And it's just about every street you go down that you will see destruction like that. I mean, the people are just - all they own is now out by the road to be thrown away. ELLIOTT: Couches, mattresses and piles of soaked clothing are stacked up curbside. ALESHA SMILEY: We got to get that bed up. You ready? 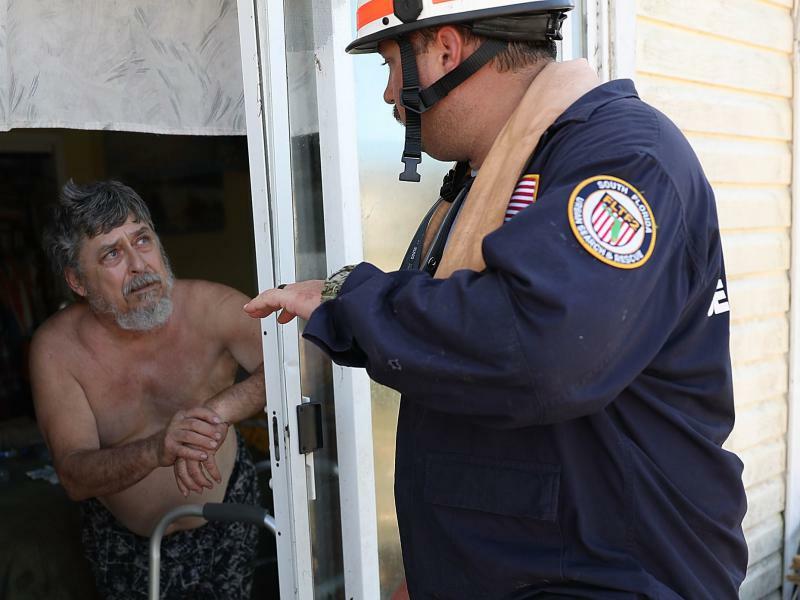 ELLIOTT: Alesha Smiley and her brother are clearing out the flooded apartment she shares with her grandmother, an elderly amputee in poor health. SMILEY: Devastating. It is depressing. I try not to think about it too hard, but it's been a lot of people coming in and helping. ELLIOTT: Mayor Patterson says the city has been getting help from relief agencies and the state and federal governments. He admits this small town of 3,500 is at the mercy of outside help because its main tax base - tourism and water and sewer bills - has been decimated. PATTERSON: We don't know how we'll pay our bills, I mean, seriously. ELLIOTT: Patterson does see signs of progress as he drives through a neighborhood on the west side of town. PATTERSON: How about it, my man? I think most of the people in this area now do have power, so that's good. ELLIOTT: He stops at an old high-school gym that's been converted to an emergency supply center. Port St. Joe City Commissioner Eric Langston is here, heartened to see people working together. ERIC LANGSTON: We still have some things to look forward to. We're still here. We're still breathing. So the worst has already happened, I mean, far as the hurricane. All we can do now is look ahead and try to rebuild. ELLIOTT: But, he says, it will be a long time before Port St. Joe gets back to a sense of normalcy. Back on the road, Mayor Bo Patterson shows me the damage in the downtown business district. The roof is off his pest control business. ELLIOTT: He contemplates the rebuilding that's ahead. PATTERSON: It's going to take years. And I'm hoping the city can survive it. ELLIOTT: Debbie Elliott, NPR News, Port St. Joe, Fla. Transcript provided by NPR, Copyright NPR. 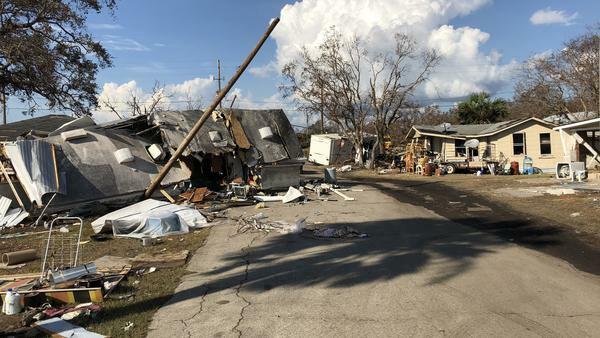 Within a week of Hurricane Michael barreling into Northwest Florida, nearly 70,000 insurance claims had been filed, with estimated insured losses of $680.7 million, according to data posted online by the state Office of Insurance Regulation.